Actual jump area is the same for all our bounce houses. This tiger belly bouncer is perfect for animal lovers or Mizzou fans! 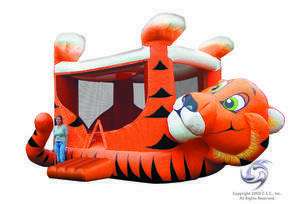 The huge jump area and 3 dimensional head and tail make this one eye-catching inflatable! Manufacturer limits are 6 particpants and 650 lbs. Churches and schools may want to look at out other bounce houses that can hold up to 1000 lbs and 8 or more participants.